Time off from a grueling tour schedule is sacred. Time off from a grueling tour schedule is rare. Time off from a grueling tour schedule is taken from me. Somewhere in Los Angeles, days before the Five Finger Death Punch press conference is set to happen… a manager is sweating, nervous… nervous of the news he will soon have to deliver to a potentially (sometimes) half-way difficult (if that) client. A client who is on a 10/12 month world tour schedule, enjoying his impossibly rare amount of time at home cooking up a storm in his kitchen for his hard working wife, alternating knife-time with meat and couch time with his daughter of a French Bulldog. Ringggggg goes the classic iPhone phone ringer. Band dude answers. News delivered. The world goes silent. "Fuuuuuckkk…" goes band dude. Manager explains the concept, respective of the fact that it cuts out vital meat out from the body of this rare time home - band dude gets it. So there I was, on an airplane again, going back to L.A. again on my "time off." The concept here is that FFDP is to put on a press conference with members of every band that is to take part on their "Trespass America" tour. I've personally never been involved in a press conference for a tour… so I was certainly interested in seeing how this thing would go down. Roadrunner put me up in a favorite L.A. hotel of mine, The London. We had a day room here once, years back on the MySpace secret show showcase at the Whiskey; I loved it then - love it now. At check in, the kind receptionist upgrades my room for free to a corner suite (not unlike the last stay even!) and I head up to check out my pad for the night. A massive floor-plan greets me… I think the square footage of this room is similar to even the square footage of my rental back in Florida. Clean, uncluttered, loads of furniture, a kitchenette, TV, free internet. The beds are huge and comfortable; 2 shower heads, wide open bathroom. I essentially have a living room, bed room, bathroom, kitchen, and balcony all within one hotel suite. After a long trip dealing with vacationers vacating from my home-state, I couldn't be fucked to travel anywhere else. I've mentioned before that I used to judge a hotel by it's room service club… and it was that time once again. The restaurant at The London is apparently "Gordon Ramsay's." I mean - of course he isn't there - but it's one he potentially would have overseen in the menu-creation and all that goodness. The London's club freaking rules. Yes - I know room service adds a maximum auto-gratuity, a delivery charge, door bell-ringing convenience-fee and all that… but I was playin' with house money here. 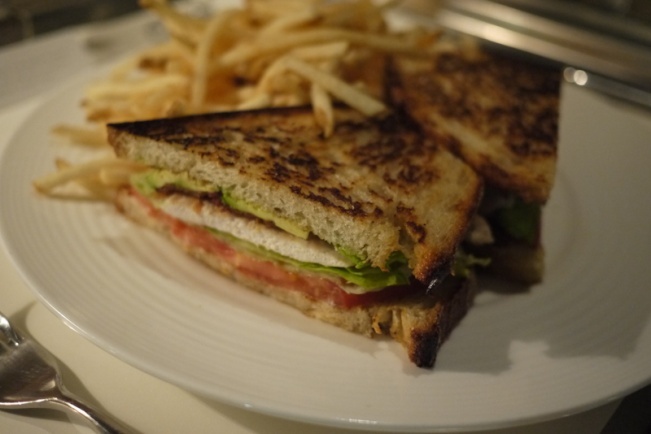 Grilled bread, avocado, grilled chicken, tomato, lettuce - simple, familiar components - but here they were done just right. The bread had a good amount of delicate crunch and thickness and that buttery bite that health freaks would have flagellated themselves for eating. Thin, crispy, salty, not-greasy fries were what I needed… and they delivered (quite literally in this case if speaking of the hotel). Great club. Perfect. I awoke sleepy and sick of flying. Prepped for the day and headed down to grab the hotel's breakfast. I am typically a skeptic of a "free" hotel breakfast. It's usually not very good. The London's? Fantastic. It was a spot called the Box Cafe - they had a fantastic array of European-style charcuterie and cheese and fruit and salmon and bread. I prefer a European-styled hotel breakfast to the American style bagels and/ or weird curdled scrambled eggs in a silver coffin. Really world class spread for the breakfast at Box Cafe. I remember the yogurt parfait being a standout. Yogurt, granola, honey, and fruit - again - things you've seen in other spots… just done better here. A bit later on, I met Justin (Trivium's manager and good pal of mine) and headed to the Farmers' Market for lunch.